A fair amount of time has now elapsed since returning from my hols, but I’ve only more recently finished uploading all my photos to Flickr, so now a quick post on what we did. We spent a week in and near Lake Geneva and the Alps, on the Swiss/French border. 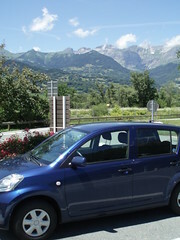 We flew into Geneva, and rented a tiny little blue Daihatsu Sirion that just about managed to fit our luggage in. I was driving – my first time in a LHD car. Got used to it really quickly with one exception – I just couldn’t remember to put the handbrake on when I stopped. Car coped with the mountains with no problem, but had a really nasty gear box. We were very fortunate to have friends in the area who let us stay with them, so we got away with just two hotel stays in the whole week. 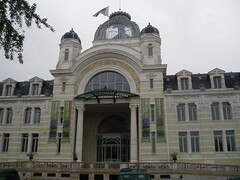 The first was on our first night, when we stayed at the Hotel “les Cygnes”, in Evian (where the bottled water comes from). 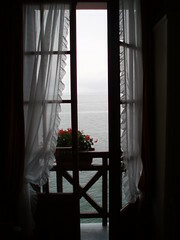 The room was lovely, with a small balcony opening right onto Lake Geneva. 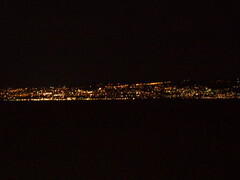 After dark, we could see the distant lights of Lausanne on the far side of the lake. I didn’t take any good daylight photos. By the following morning, a mist had fallen, and you could barely see a thing. Whilst at the hotel, we ate in their restaurant, and had one of the best meals we’ve ever eaten. 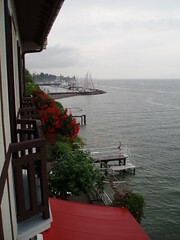 We started out on the terrasse overlooking the lake, but the weather changed during the evening, with wind and rain eventually blowing in hard enough to get us wet and nearly tear the awning off the side of the hotel. I had: chilled red pepper velouté; bunny terrine; a lamb main course and a very light coffee mousse to finish. A bottle of Hautes Cotes de Beaune went very nicely with it. 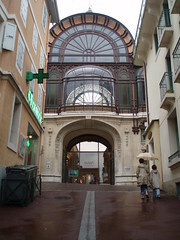 The following morning, we rose late (too late for the buffet breakfast, but they kindly made us a tray with coffee, croissants) explored Evian briefly on foot, taking in the Palais du Lumiere and the a touristy mini-museum dedicated to the bottled water. 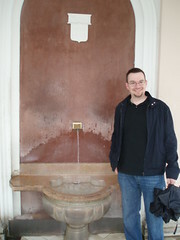 There’s also an umimpressive mini-fountain where the spring water flows freely, and you can fill your own bottles. It was quite hard to get pictures because of all the locals refilling dozens of bottles they’d brought with them. After a British picnic (one eaten in the car in the rain overlooking the sea / lake) we drove inland from Evian up through mountains towards Morzine, a French ski resort town. We were meeting my friend A whose ski apartment we were borrowing for a few nights – but we were going to arrive long before she finished work, so we stopped off en route to see Les Gorges du Diable, a walk along steel pathways down into a very deep gorge carved by a river and meltwater. All around were signs warning that higher up the stream, there was a hydroelectic dam installation. Water levels can rise suddenly and without warning – even in times of drought. Access to the river strictly forbidden! Eventually we arrived in Morzine, which for a town in the mountains had a strange feel of the wild west about it – lots of wide streets and wooden buildings. Many of the buildings were pretty chalets; but many just looked like they should have had sheriffs and gunslingers in them. V strange. We met up with A, and saw the huge chalet she manages with the help of a staff of 16. Nosed around a bit whilst she finished her working day – v impressed by the small kitchen, and the instructions for the chef that said for €7pppn, chef had to provide four meals (mini cooked breakfast, full lunch, afternoon tea and 3 course evening meal). These skiers clearly like to eat! From there to A’s chalet, which she’s in the process of doing up with her other half – which had some frightening original features – and from there to the well appointed duplex apartment much higher in the mountains where we were staying. I should point out at some point that this is probably the last joint mountain holiday we will ever have. P is not keen on heights one bit, and much of the windy roads (which I find exhilarating) scare him witless. The road up to the apartment was one such. He had to enjoy the view from the balcony from safely inside the French doors. I’m getting ready for our choir week, which will be in Hereford this year. I’ll be staying with my parents in Leominster and commuting into the city every day. From Monday, we’ll be singing Evensong every day. Our music list is now here on the Cathedral’s website. Greatly looking forward to the week. The music will be a real challenge this year as much of it is new to me. There are at least six pieces of music on the list that I have never sung or heard before – maybe even more. I don’t even know Monday night’s music, so it’s going to be a steep learning curve on the first day alone! At the end of last year, I took the cassock home so that I could clean it (after five years of singing in it on hot summer days it didn’t smell good) and so that I could move the buttons around. I’ve changed shape since I first started using it, and it no longer fitted very well after last year’s week. Happily there’s loads of spare material in a cassock, so just repositioning the buttons means it fits again. People who send messages to usenet often append a four line bon mot to the bottom of their posts, called a signature or sig. I fill mine with random quotes from things I’ve seen, heard or read that have just tickled me in some sort of way. I used to update it every few weeks, but I think this has become an example of how time is passing faster these days. But something I heard on something I was watching today has made me change it again. I came to find you, Gabriel. My name is Chandra Suresh. I’m a geneticist. I have a theory about human evolution, and I believe you are a part of it. Today we had a visit from the Notts Energy Partnership to consider whether solar hot water might work for us. They run a project called Sungain, which is about bringing solar hot water to as many homes as possible – and in the process drive capacity amongst local firms for putting solar panels on local roofs. Just for good measure it’s the first properly sunny day for ages, so we could see clearly that the roof over our car port gets its fair dose of the rays – at least until 2.30pm when the sun goes behind the tree. Our house is oriented with the corners on the compass points, which means we don’t have a south facing roof, but a south-east facing one. This is less good, but not impossible. It’s not a trivial job to fit one in this house. We already have a hot water cylinder based system, but at present our hot water is only used for hand washing and the little hand washing up we do. There’s neither the pressure or capacity in the current old cylinder to run showers, which would be the main point of embarking on something like this. It is quite a lot to do, and won’t be cheap. But in the context of some of the other things we are spending on the house it is an affordable cost. It’s not a great deal more than the cost of new windows. There are still some things to weigh up. Pay-back time. This should give us cheap or free water heating for much of the year. Even over the winter, on bright days, the kit should mean the boiler has less work to do to get the tank of water up to temperature. But calculating payback will be complicated. It will mostly be electricity we save (no need for electric showers). Still more work to do on the house and plumbing! EDIT: Good grief, a bath/shower mixer tap costs over £100, according to B&Q website!